Garbage disposals are awesome things. In theory, they prevent odor from decaying food because they chop it all up to the point that it can safely go down the drain. But once in a while, something goes wrong and you end up with a smelly garbage disposal. There are several reasons for this, and plenty of easy solutions. I’ve focused on ones that don’t involve specialized products or processed chemicals. Why is the garbage disposal stinking? Start by checking the simplest things to fix. Is the odor coming from rotting food that’s stuck to the rubber flaps at the drain? If so, clean under them with an old toothbrush and some detergent suds. 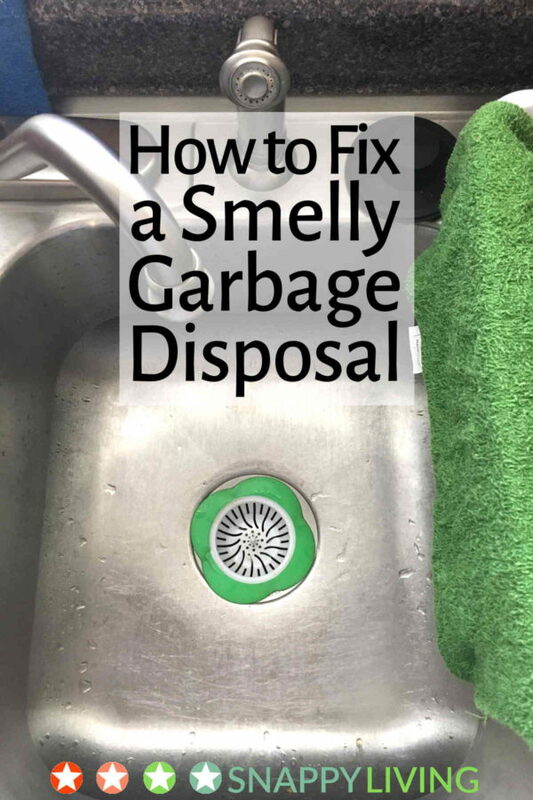 If that’s not it, and the disposal is working normally, then you just need to drop in something to counteract and clean up that odor problem. There are a lot of things that can help. Put any of the following down the disposal, turn cold water on so it’s running into the disposal, and turn on the disposal long enough to chop up what you’ve put down. Citrus rinds. Or a half lemon or lime. If you do this every week or so, you will probably never have enough bacteria building in your disposal to create an odor. About a cup of white vinegar and some ice cubes (to give the choppers something to work on). You can also make the ice cubes out of the vinegar, but I don’t find this works any better, and it seems like extra work. It’s good if you’re trying to conserve water, however. Just the ice cubes will often do the trick, too. If none of those do the trick, you need a more intense cleaning (after which you can probably get by with one of the above, as long as you do it regularly). Pour half a box of baking soda down the disposal. Pour white vinegar in next – slowly. This will cause the baking soda to foam. Keep pouring vinegar until there’s no more foam coming up. Turn on the disposal and the hot water. Let the disposal run for 1 minute. Let the hot water run for another 5 minutes. That should take care of any problem that’s actually in your disposal. If it doesn’t do the trick, you may need to look into whether there’s a clog in the line or something else causing the stink. If you want something that’s even quicker to use, or if none of the others work for some reason, I’ve had good luck with Plink. You just drop it down the sink, turn on hot water and run the disposal for 15 seconds. It breaks down food deposits and seriously cleans out the disposal. If you have the manual for your dishwasher, read and follow the instructions for use. Every manufacturer recommends slightly different practices. If you don’t have the manual, you may be able to search for it online. But in a nutshell, here are the basics that apply to most garbage disposals. Always run cold water while running the disposal. A stream of cold water keeps the food running smoothly through the disposal and prevents food from getting caught on the blades or elsewhere (which is how a lot of stink begins). A medium stream is fine – it doesn’t have to be on full blast. Avoid putting large amounts of fats or oils down your disposal. I find a little butter on a plate goes down fine, but your disposal is not the place to pour the cooking oil from the deep fryer. Instead, put that oil in a disposable plastic container and put it in the regular garbage. Fibrous stuff. Don’t put celery stalks down your disposal. Chopped celery is okay since the fibers aren’t long enough to tangle around the blades, but it’s a good idea to put it down a few bits at a time, or with other items. Gummy foods. Pasta can cause clogging. I find it’s okay if you’re just washing down the small amount of pasta left over on someone’s plate after dinner, but large amounts of pasta are definitely to be avoided. Thanks. I have been looking for something I could use that didn* t involve something bought. Will try all of these!